From late 1960s members of the Ballinascarthy GAA club relentlessly pursued the establishment of an independent underage Club which would address the unsatisfactory position at underage of many potential players getting no games. However, in 1973 a breakthrough was achieved, when a concession was granted to the Ballinascarthy club by the Cork County Board, to allow the establishment of a separate underage club Pedlars Cross or Croise Peidlear, âdrawing players from more than one parishâ. The newly formed Pedlars Cross Club location was within the Enniskeane parish providing the advantage of not having to look for permission to use players from this parish. A number of football league games were played in 1973, this was followed by participation in U-14 Football and Hurling championship games the following year. The Clubâs first Carbery divisional success came in 1976 for the U-16 hurlers, who subsequently went on at County level to defeat Eire Og and eventually lost to Carrigaline in the County Semi Final. Success was achieved again in 1980 at U-16 football when the club won the divisional title. On the 10th anniversary of the club's foundation in 1983, 3 divisional titles were won at U-14 football, U-16 Football and Hurling. The first period of continuous success was achieved from 1987 to 1989 where divisional honours were achieved at every age level. A similar pattern occurred in 1990s when most success came from 1996 to 1999. In 1999 the minor hurlers reached a county final against Mill Rovers only to be beaten by a 4 point margin. 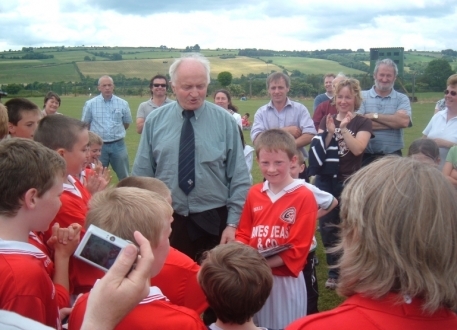 In the current decade the Club has been hugely successful over the last 4 years winning several divisional titles at U-12, U-14 and U-16 in both hurling and football. Some would indeed argue that perhaps too much success is being visited on underage players and the incentive to be successful in adult teams may not be as strong as it could be. A huge amount of credit must to the clubs officer core, supported by loyal and committed mentors for the success that this Club has a achieved over the last 35 years.